DDA friend Jon Esparza, creator of Bubble Fox and the CrazyVerse, threw down the “Helium Challenge” to Dogs Ducks and Aliens. Now, those of you who are just reading about Jon for the first time here, may be interested to know where this challenge comes from. Jon has infectious enthusiasm for the art of making comics and encouraging fellow artists to stretch out and create things out of the ordinary. Jon communicates daily to fellow artists, offering feedback, encouragement and coming up with ideas to create “extra” things that challenge the artist to think outside the box as well as support the feeling of cameraderie among us comic creators. If comics were baseball, he’d be the high-energy shortstop, chattering it up to keep things fun and keep everybody’s head in the game – the team “sparkplug”. Now having said that, Jon has a particular affinity for physical comedy in his work, and is talented with the use of air in various ways to bloat, float, and otherwise “expand the horizons” of his characters. Go to the Friends page here and link to Jon’s work at Crazy Verse and Bubble Fox – his work speaks better than I can describe. 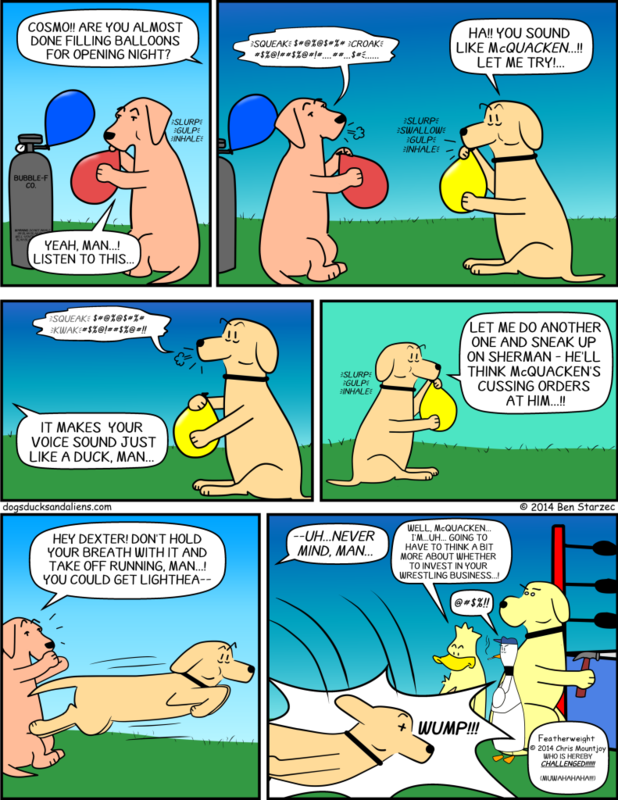 Anyway, back to the Helium Challenge – Jon’s words to me were to draw a comic that incorporated helium in some way. Hmmm…the DDA characters are very real guys to me, and I had to think “what would these guys really do if, say, you introduced a helium tank into the story?” Well, I knew right away what they would probably do with it, so I accepted the challenge, although it may be a little off-center of the original intention…Anyway, here is the result and I hope you enjoy it! Love it! What a way to rise (pun not intended but darn it, I’ll take it) to the challenge!!! I’ll have to check out Jon now. Haha, this is an excellent challenger for the Helium Challenge! Great job, Ben! The whole concept is so much fun, too! Jon Esparza IS an amazing cartoonist and a great guy!